Skullcandy; now there’s a naming success. 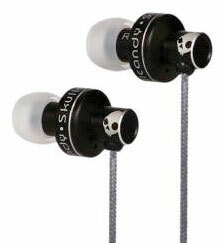 Skullcandy’s a little company that markets a wide selection of headphones, earbuds, and accessories. I’ve never had any trouble remembering this firm’s name! Skullcandy’s target audience is the skater/hiphop crowd, but don’t let that (or their too-cool-for-school website design) drive you away, even if you lean more to the fuddy-duddy side of the spectrum. Skullcandy sent the Weeks Division of MyMac Labs review sample of their iPhone FMJ earbuds/microphone. FMJ stand for “Full Metal Jacket.” I wonder if the marketing people have seen the 1987 Stanley Kubrick film titled with this expression. The FMJ’s cable is wrapped in aluminum foil, and the earbuds themselves finished in a matching aluminum color. The overall effect is quite stylish. The main drawback to the foil-wrapped cable is that it tends to be stiffer than either the Apple cable supplied with the iPhone, or the fabric-covered cable that V Moda Vibe Duo uses. I loved the FMJ’s sound quality. As with all earbuds, it’s critical to get a good seal in your ear canal. I had good results with the silicone ear tips; they provided a warm, full bass response, and clear highs that were not shrill or tinny. In case you don’t like the fit or sound when using silicone ear tips, Skullcandy ships the FMJ with COMPLY foam ear tips. The COMPLY tips provided a better fit and noticeably better sound, but require more time to place in the ear. The foam takes about 15-30 seconds to conform to your ear canal, requiring the user to hold each ear bud in place until the foam expands and conforms to the shape of your ear canal. Once in place, I enjoyed better sound than with the silicone tips. Obtaining a proper fit with foam tips takes some time and care, and its a nuisance to use the COMPLY tips for shorter listening sessions. If you receive an incoming phone call, and you don’t already have the COMPLY tips in, the call will end up on voicemail before you get them in and fitted. In contrast, the silicone tips can be popped in with no delay. The quality of the inline microphone was normal, no better or worse than the Apple or Vibe Duo microphone. The Play-Pause button worked as expected. The FMJs had a few drawbacks in daily use. While bigger drivers generally produce better sound, the driver section of the earbuds that rest outside the ear canal are rather large. They actually rubbed against the folds of my normal-sized ears. After a few hours, this became a bit annoying. Small-eared people may find the FMJs are just too big to fit the outside part of their ears. The 1.1 meters/43 inches long cord was just a trifle short for my usage patterns. I often keep my iPhone in my pocket, instead of on a belt clip, and another three or four inches of cord would have been perfect. Another minor nit worth picking is that the review unit buds had no Left or Right markings, making it impossible to tell which bud should fit into which ear for proper stereo channeling. Summary: Don’t be scared away by the Skullcandy name or website. The FMJ is a quality iPhone earbud/microphone combo. Small-eared users may find the drivers take up too much space in their ears. actually the fmj headphones do show what earbud goes in which ear. if you look where the silicone tips are and look a little under it, it says R, and if course the other one is an L.